Over the late summer, Canada’s political situation became more competitive, as Liberal Party support dipped, and the Conservatives saw gains. Today, an election would see 39% vote Liberal, 35% Conservative and 15% NDP. 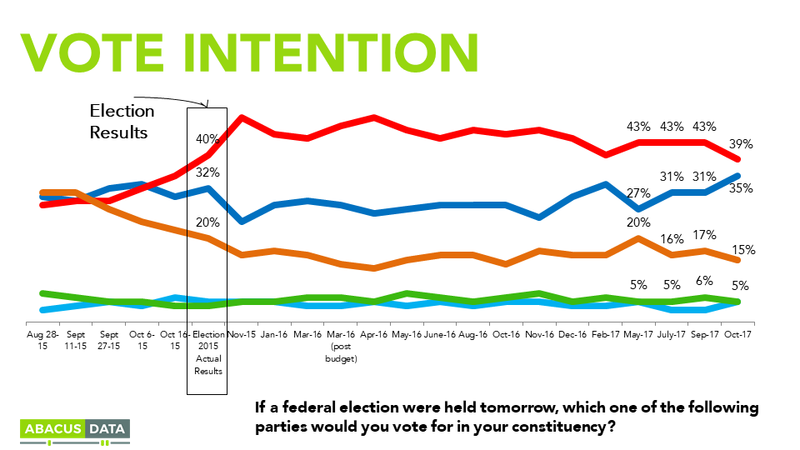 The biggest regional races show a dead heat in Ontario, a narrowing Liberal lead in BC, while in Quebec the Liberals continue to lead by 21 points, although we do see a rise in BQ support. Government approval for the Liberals which has held around 50% since the end of 2016, saw a sharp drop to 40% with 38% disapproving of the job performance of the federal government. Despite this, views of Prime Minister Trudeau remain solid with 48% having a positive impression of him. We also report on how Canadians are feeling about the proposed tax changes for private businesses in this report. For all the details, be sure to check out the full release below!